Here is another design I created using the nail tattoos I received from Fake Tattoos. This one features a little three pointed hat, which I interpreted as a jesters hat, from the Hearts & Bow design. 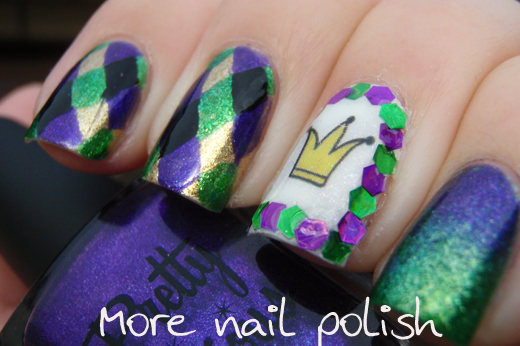 I created a skittlette with this mani, where I used three designs across five nails. For my thumb and pinky, I started with my nail painted with Pretty Serious Poltergeist Puddle and then sponged on a gradient with China Glaze Running in Circles. For my index and middle fingers, I started with a base of Zoya Ziv and then painted on free hand diamond shapes using Pretty Serious Poltergeist Puddle, China Glaze Running in Circles and black. On my ring finger, I used a white base and then applied the fake tattoo. 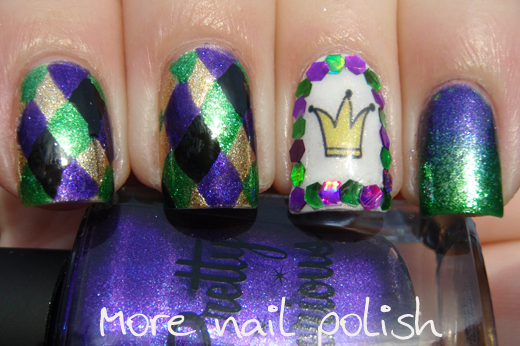 I then place alternative purple and green holographic hexes as a frame around the nail. Up close my harlequin design looks pretty messy and uneven because it was done by hand, but at a normal distance these looked so effective. I really loved this mani. The other thing I discovered is that the Fake Tattoo really have to be placed over a pale nail colour. I originally place the yellow jester hat tattoo over a base of Poltergeist Puddle, but you just couldn't see it at all. The yellow colour is transparent, rather than an opaque yellow. 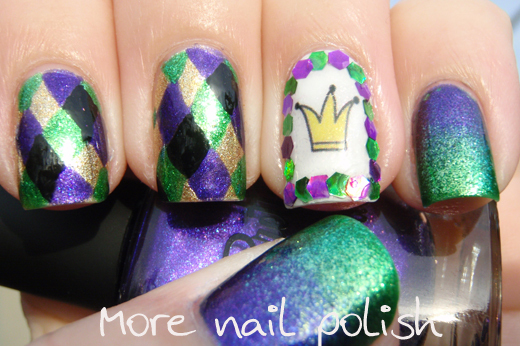 Luckily the pack had five little hats, so I still had spares after redoing that nail. So pretty - they remind me of mardis gras or the Rio carnival. The glitter hex frame would have taken more patience than I have ;P It looks great! 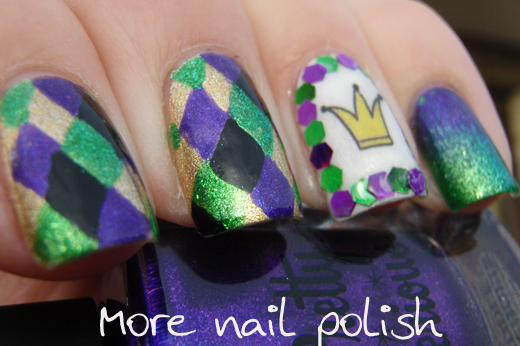 This is such a beautiful and fun manicure. I love how the colors go together!